Industry analyst Michael Pachter says that there's "no meaningful market" for Sony's PlayStation Now streaming service. PlayStation Now was arguably one of the more interesting things that Sony unveiled at its CES presentation last month. Proposed as a service that would allow gamers access to PlayStation software via streaming, its success could potentially spread the PlayStation brand outside of traditional gaming hardware and into new markets including smartphones, tablets and TVs. That being the case, there are some who have their doubts as to whether the service can even hope to be successful. Industry analyst Michael Pachter would be one of them. 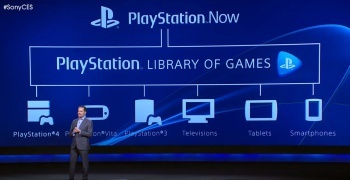 "PlayStation Now is a joke," he said in a recent interview. "There is no publisher that is going to license content that's less than two-years old because they would be concerned that they can't sell as many copies if they make it available for subscription or rental. This has no prayer of working. None." Speaking to The Escapist, Pachter affirmed his comments. "There is no meaningful market for the old games Sony is going to get," he said. Granted, Pachter could have a potential point about the library that future Now subscribers can expect. After all, publishers would probably stand to earn more from retail profits than they would from giving Now users at-launch acces. That said, there is some counterpoint precedence of companies allowing their more recent products to be given away via Sony's services. Just yesterday, for instance, PS Plus subscribers gained access to Outlast, a brand new release for PS4, as well the PS3 version of Metro: Last Light which is less than a year old. If Sony was able to include titles like those in PS Plus, it stands to reason that PS Now might not just be limited to games past their prime. That said, Pachter still doesn't think PS Now is comparable. "Sure, PS Plus is a great deal, and the free games make people more likely to join, but the real reason to join is [PS4] multiplayer," he said. "PS Now doesn't get you multiplayer."